Free! A printable blank family tree for recording the ancestors of two people on one sheet. It's an 'Our' family tree rather than 'My' family tree. It's an 'Our' family tree rather than a 'My' family tree. My family tree diagrams (below) record the ancestors of two people. 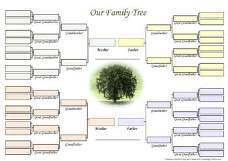 As such, they are 'Our' family trees, rather than the more common 'My' family trees. Each chart holds four generations of ancestors. The ancestors of one person take their places in the top half of the tree, the ancestors of the other take the lower half. This becomes clearer as you fill in the tree. You can choose between three versions, each of which has a photo of a full-bloom tree at its centre. 'Our Family Tree' includes the ancestors of two unrelated families (typically a couple). The first shows the tree in its genuine early-summer bloom and colours. 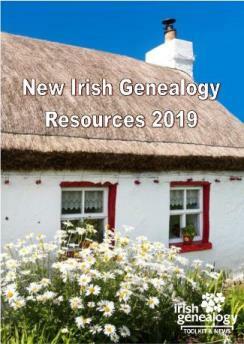 The second, designed for those who want to emphasise their genealogical roots in the Emerald Isle, shows the tree with a green tint applied. In the third version, the tree appears in sepia, instantly adding a sense of antiquity. Whichever version you choose, you'll need a pdf reader installed on your computer. If you don't have one, or your default reader doesn't display these files correctly, go to www.adobe.com to download the latest free version of Acrobat Reader. If your genealogy research hasn't yet got as far as four generations, choose this free family tree chart for just three generations. If your genealogy research hasn't got as far as four generations, choose this free family tree chart for just three generations. Option 1: Fill in by hand - Open the printable blank family tree and select print. When it has printed, fill in the spaces by hand. Option 2: Fill in on screen and print - Download the printable blank family tree template to your computer. You can then fill in the spaces your computer screen, and print the tree when you're ready. You don't have to complete the tree at one sitting. You can save your work at any stage. Option 1: Fill in by hand - Open the printable template and select print. When it has printed, fill in the spaces by hand. Option 2: Fill in on screen and print - Just download the blank template to your computer and start filling it in on screen. You can save your work at any time; you don't have to fill it in at one attempt. When you've filled in all the names, just print. Option 1: Fill in by hand - Open the printable blank family tree and select print. Fill in all the names by hand. This tree isn't currently offered in Option 2 mode. ► Not got 4 generations for both families? Try these free family trees for three generations. 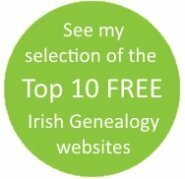 ► Choose from a full range of free family history forms and genealogy charts. ► See Toolkit's full selection of printable blank family tree templates – they're all free.